Who says baking has to be hard work? 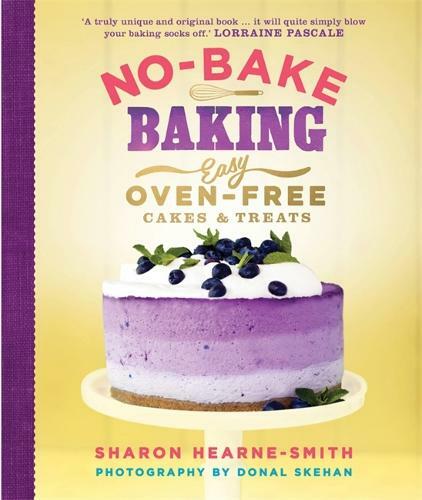 In No-Bake Baking, Sharon Hearne-Smith shows how to create over 100 impressive sweet treats with absolutely no need for conventional baking. These easy recipes can be magicked up in your fridge, freezer, microwave or blender - or even your slow cooker, bread machine or sandwich toaster! Sharon cleverly transforms simple ingredients like rice krispies, pancakes, cookie crumbs, popcorn and marshmallows into stunning cakes, biscuits and desserts, saving you hours in the kitchen and guaranteeing gorgeous results every time. You'll find an array of jaw-dropping temptations, from iced lemon meringue cake, striped blueberry cheesecake and deep-pan double-chocolate mousse pie, to traybakes with a twist, such as rocky road white knuckle ride, trillionaire's toffee tiffin and orange & hazelnut 'brownie' bars. Enjoy sweet mouthfuls like mini pecan pies with pretzel bases, chocolate peanut butter cups, and super-cute doughnut pops, plus inventive layered refrigerator cakes, frozen bombes, a back-to-front trifle cake and much, much more.